My son really enjoys playing Minecraft. Anytime he earns computer time, he will choose to play Minecraft. When we saw that this Bible was up for review, he asked me to request it right away. This Bible is the New International Reader's Version. It is based on the NIV version of the Bible. That means it contains the entire text of the Bible, but that it has been simplified for a young reader or a person, who is new to reading the Bible. This is all explained in the front matter of this Bible. Throughout the Bible are full color pictures. 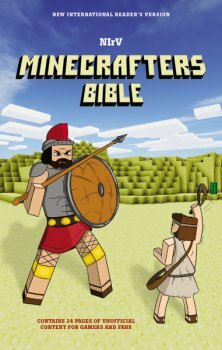 The pictures are created in classic Minecraft style and depict an important event in the Bible. An explanation of the time period is given as well as a portion of the scripture to read. The reader is then given a challenge to recreate the picture in the game. This is what I assume to be the "unofficial content for gamers and fans". It is pretty creative and enjoyable to look at these illustrations. There is a small dictionary at the back of the Bible as well as a list of Bible stories along with references where to find them. Both of these are helpful to new readers or growing readers of the Word. This is a fun and engaging hard cover Bible that will encourage many young people to dig into scripture and read the word. It is also a fun way for them to interact with important events in the Bible. Re-creating the scenes will help them to dwell on the events and really ponder what is happening and how it is significant to their lives.